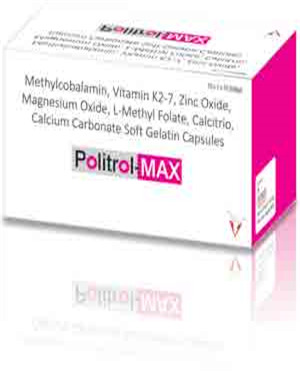 Magnesium Oxide 50 mg + L-methyl Folate 800 mcg Softgel Caps. Increases renal tubule phospahte resorption consequently decreasing serum phosphates level, PTH level and bone resorption. Reduces the risk of bone fracture. Deficiency of Vitamin K2 has been found to affect fracture healing. Low level of Methylcobalamin & Methyl Folate is linked to increased risk of osteoporosis. Supplementation of Methyl Folate & Methylcobalamin is safe & effective way of reducing the risk of fracture.